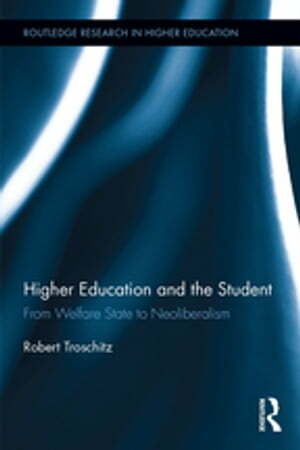 Collins Booksellers - Higher Education and the Student by Robert Troschitz, 9781315448220. Buy this book online. As one of the pioneers and leading advocates of neoliberalism, Britain, and in particular England, has radically transformed its higher education system over the last decades. Universities have increasingly been required to act like businesses, and students are frequently referred to as customers nowadays. Higher Education and the Student investigates precisely this relation between the changing function of higher education and what we consider the term ‘student’ to stand for. Based on a detailed analysis of government papers, reports, and speeches as well as publications by academics and students, the book explores how the student has been conceptualised within the debate on higher education from the birth of the British welfare state in the 1940s until today. It thus offers a novel assessment of the history of higher education and shows how closely the concept of the student and the way we comprehend higher education are intertwined. Higher Education and the Student opens up a new perspective that can critically inform public debate and future policy – in Britain and beyond. The book should be of great interest to scholars, researchers, and postgraduate students in the fields of higher education; educational policy and politics; and the philosophy, sociology, and history of higher education.